Have you seen the videos of cat leaping in the air to get away from cucumbers? If not google it. There are too many videos to post. My cats didn't care, my friends cats didn't care. I don't know how true it is but I heard that cucumber smells like copper heads to cats so indoor only cats wouldn't make that connection. Which explains why my cats just looked at me like I was crazier than normal. While I'm not surprised about Charlie sheen I am really sorry for him. While I sometimes wish I had celebrity money I wouldn't want the yes people that go along with it. I really feel like he had some not so positive influences telling him his out of control lifestyle was the way to go. 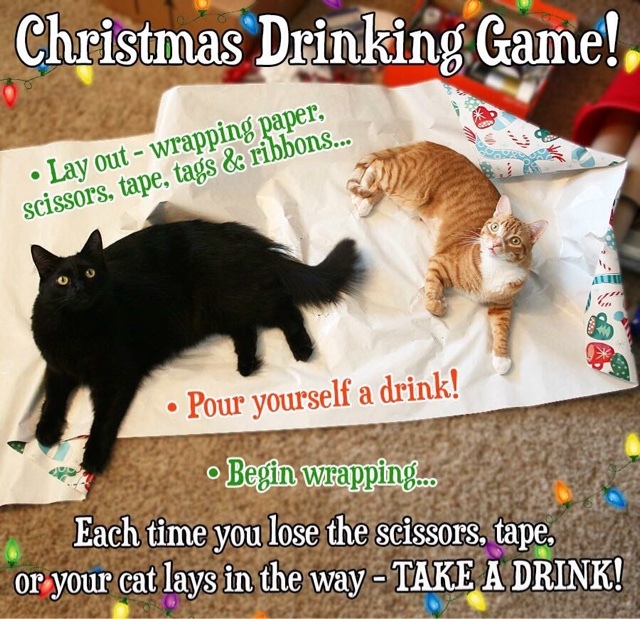 I found this drinking game and will be giving it a try. I have a feeling this will be the worst wrapped presents every.